Tangled and True: glass jars. 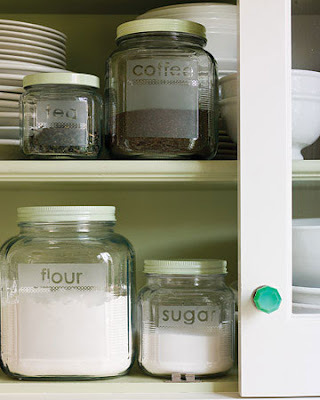 I just saw this idea at Apartment Therapy and love it! I've etched some glass before (namely casserole dishes) and know that it's easy enough, but never have I thought of doing glass jars, perhaps I'll even pull out the etching lotion today. I'm inspired..
see directions from Martha here. I love this idea! I wish had a machine that could do that. i love those jars too...i saw them on martha stewart. i don't have a cricut to cut the stencils though, any suggestions? ?